OTTAWA – Prime Minister Justin Trudeau is defending his decision to threaten Conservative Leader Andrew Scheer with a libel suit, saying that “there are consequences” for misleading Canadians, which he believes Scheer has done amid the SNC-Lavalin affair. “I think highlighting that there are consequences short-term and long-term when politicians choose to twist the truth and distort reality for Canadians, it’s not something we’re going to put up with,” Trudeau said on his way into a cabinet meeting Tuesday morning. The potential lawsuit came to light over the weekend when Scheer held a press conference in which he distributed copies of a letter from the prime minister’s lawyer. The letter to Scheer gave notice of a possible libel lawsuit over a statement the opposition leader issued on the day that Jody Wilson-Raybould’s supplementary statement and audio evidence related to the SNC-Lavalin scandal was released. Scheer has said he stands by his comments and welcomes the opportunity for Trudeau to test the case in court, where he’d have to testify under oath about the scandal, something the Conservatives have been calling for. Trudeau said in French that if Scheer withdraws the statement, he’ll find that satisfactory and would not pursue the lawsuit further. “I think it’s important that all politicians be straight with Canadians in how they characterize their own actions and their own beliefs. I think we’re going to have an election in the coming months, you can’t be inventing things, you can’t be lying to Canadians,” Trudeau said. 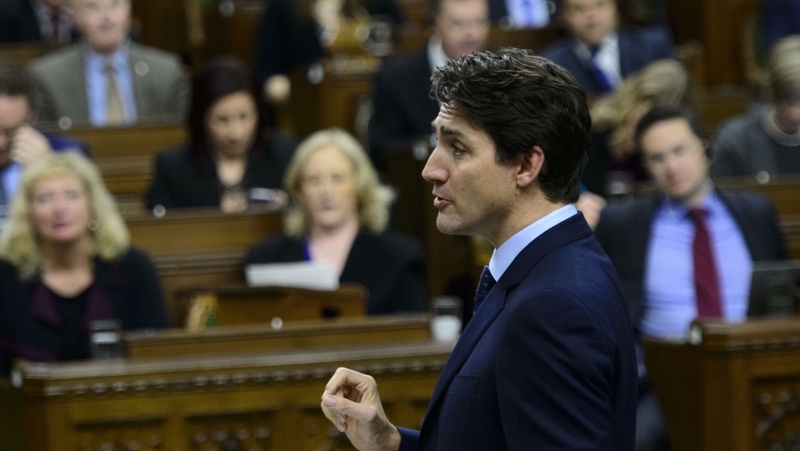 The potential court case dominated question period on Monday. Government House Leader Bardish Chagger fielded the questions in the prime minister’s absence. Trudeau attended question period today and this potential lawsuit once again was the dominating topic of questions he faced.